Rain is an original character (OC) I’ve drawn under several different names; Jo, Iry & Iry-Jo. She’s actually from an from an online RPG, hence the ever evolving names. I thought, since she’s one of my favorite characters, she’d be the perfect choice to work with. Rain was used for my “Learning to use My Tablet” project – which has fallen by the wayside as the tablet died and I never bothered to buy a new one. All of the Vintage clothing is for her. I couldn’t decide on a version of the doll. The “brown” version is the original, but her color is blue. I was happy with both, so the choice is yours. Or print them both and have twins. Rain – the brown version. feel free to share her, print her, and do anything you want except sell her or claim her as your own work. 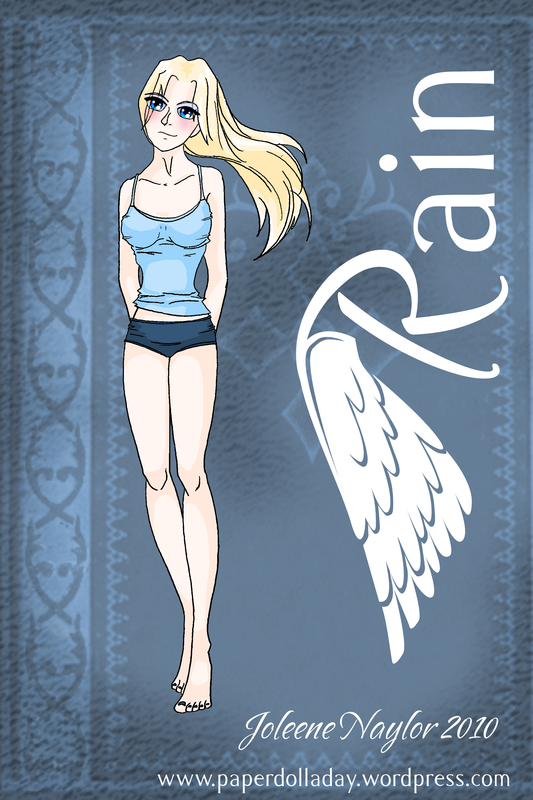 Rain – the blue version. feel free to share her, print her, and do anything you want except sell her or claim her as your own work.